Every year the Theresienwiese in Munich is transformed into the largest public festival in the world for two weeks. The Oktoberfest attracts between 5 and 6 million visitors every year. So many people in a public place also place special tasks on the security authorities and emergency forces. The use of drones at such major events or in emergency situations can provide considerable support to the fire brigade, police or aid organisations. There are many possible applications for the unmanned flight systems, which can be equipped with a large number of sensors. On the one hand, this can be a quick and comprehensive situation assessment from the air, through which a corresponding reaction in real time is possible. On the other hand, special sensors such as a thermal imaging camera or a laser scanner (LiDAR) can provide the command and control unit with information that would not be visible to the naked eye. 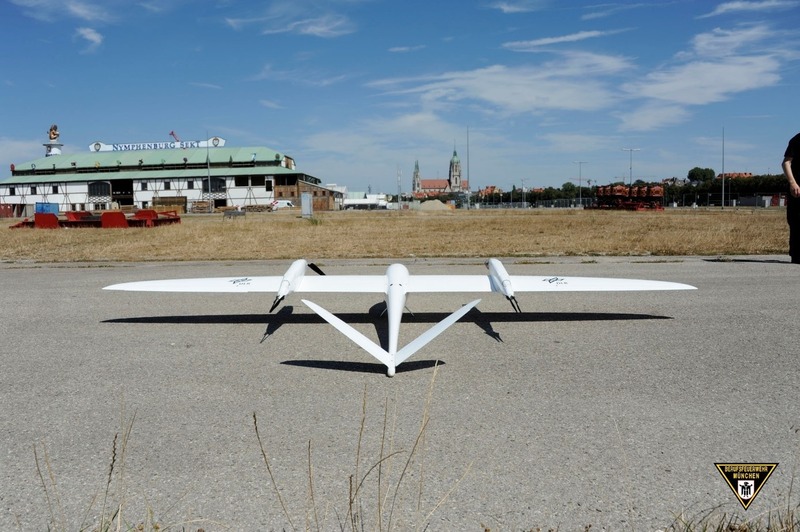 On 9th of August 2018, an event with a practical demonstration took place on the Theresienwiese in Munich as part of the DLR (German Aerospace Center) research project Live-Lage. The aim of the project is to use UAVs to clarify complex or geographically extensive operational sites and to provide the emergency services with a detailed picture of the situation in real time. As a result they can guide the emergency services in a targeted manner. In cooperation with the Duisburg fire brigade, the DLR is developing a novel concept for the rapid reconnaissance of major damage and disaster situations in urban areas. Among other things, DLR is developing an optical reconnaissance system for this purpose, which is mounted on the UAV Tron from Quantum-Systems. 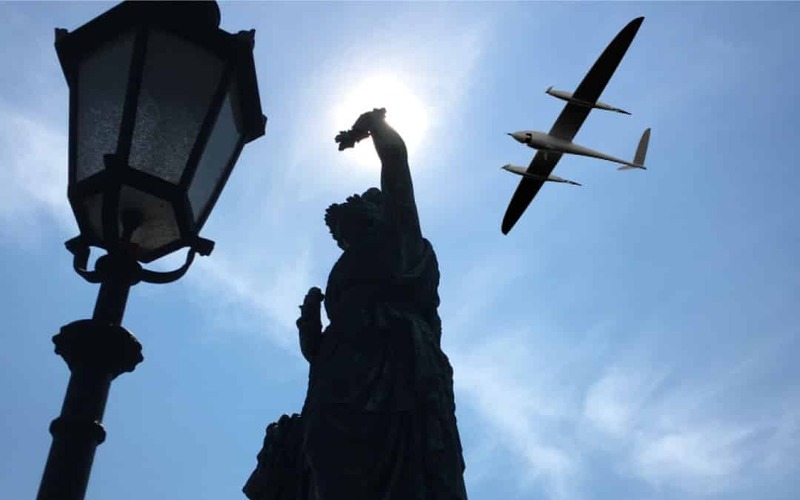 Quantum-Systems is a company based at the special airport Oberpfaffenhofen / Gilching / Germany which specializes in the development and production of electrical vertical take-off and landing (eVTOL) aircraft drones. Like the smaller Trinity model, the Tron used for this purpose is an innovative, purely electrically powered unmanned aircraft. The main feature of the two transition aircrafts are swivelling propellers which, thanks to the autopilot developed in-house, can be tilted fully automatically in such a way that the aircraft drones can take off and land in the tightest of spaces, such as helicopters. After the transition phase, they have the aerodynamic efficiency of an aircraft in horizontal flight. These features, combined with a variable payload of up to two kilograms, make the Tron the ideal platform for civil security tasks. It allows the use of a variety of sensors on a single aircraft. A flight time of up to 90 minutes allows monitoring of an extended mission or enables flying over a large area without a stopover. The Tron flew above the Theresienwiese at a height of 170 m for 10 minutes to record data for evaluation. During the Oktoberfest, this data provides the rescue and security forces with a high-precision 3D map as a basis for planning operations. A special camera by the DLR was integrated into the variable payload compartment of the Tron, which allows images to be captured with a high level of detail. With the MACS camera system (Modular Aerial Camera System), it is possible to produce a highly accurate position map for the operations management on site almost in real time. Due to limited space available on site and the large area to be mapped, only a small aeroplane can be used as a carrier for the camera. The ability to take off and land vertically makes the operation a lot easier. After all, the goal was to map the 420,000 m² Theresienwiese within a few minutes with a resolution of less than 3 cm. With the specially manufactured camera of DLR, an exact position map of the Theresienwiese could be produced within a very short time. Due to the high sensitivity of the camera, details relevant for use are visible even in dark and heavily shaded areas of the terrain. The speed of data acquisition and processing is also of great importance. In the future, it is conceivable that the camera will also be able to provide information during operation. “For us, such a system is a great support. We see the potential of the MACS camera in the “Wiesn” (coll. term for the Oktoberfest) preparation and in perspective also during such large events,” says a representative of the Munich fire brigade. Since the system is capable of informing rescue and emergency forces in real time on the basis of the map of the location where help is needed – for example, if the number of people at certain locations becomes too high – the combination of Tron + MACS is also intended to provide support during ongoing major events. The Munich Fire Brigade sees a possible use outside the support of major events in the search for persons. Two helicopters are often used at the same time to search for missing persons, for example in waters such as the Isar. One for the search and one for the rescue. According to the fire brigade, searching for the missing person with the MACS camera could save time and money during such rescue operations. The recording of the area in the run-up to the Oktoberfest can therefore only be the beginning of the use of the Quantum-Systems Tron in combination with special sensors in the civil security sector. Tests such as this provide important insights into how the system can be used in the future to support emergency forces, prevent disasters at best and even save lives.